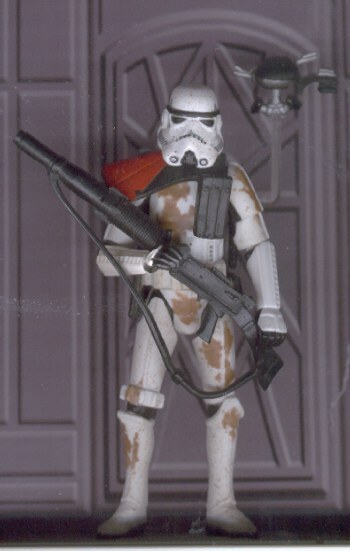 This Sandtrooper was made from the POTJ Sandtrooper and the forearm from the POTF Stormtrooper. I used the leftover arm from my custom Stormtrooper. I had to trim down the "mushroom" of the peg and also some of the base of the peg to get it to fit right in the Sandtrooper upper arm. Then I painted the shoulder pad orange. I gave him the grenade launcher, and the sculpt of the new backbpack allows you to stick the Probe droid between the two boxes.